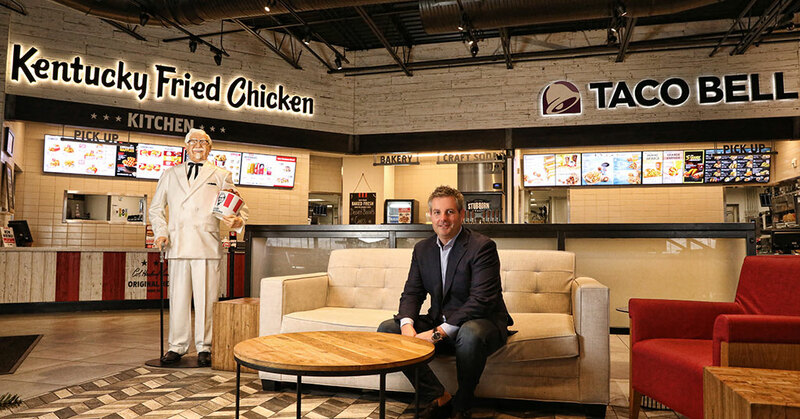 With more than 700 KFC and Taco Bell restaurants spread across 20-plus states, Michael Kulp, president and CEO of KBP Foods in Overland Park, Kansas, oversees one of the country's fastest-growing restaurant companies. Under his leadership, KBP's annual revenues have grown from $70 million to $780 million, with projections of $900 million in 2019. Kulp credits his success to understanding the power that comes with doing the simple things well. "What keeps the business safe, performing, and healthy is when we run really good restaurants inside our four walls," says Kulp. "I know that keeps our relationship with our investors, bankers, and franchise owners very healthy. My bias is to always start and stop there, and build an infrastructure around each set of restaurants, as though that business were no larger than that set of restaurants." Kulp grew up in the restaurant business. He got his first restaurant job the day after he turned 14, at a hometown burger joint in Lamar, a small town (pop. 7,601 in 2017) in southeastern Colorado. He never left the business, and would learn early how to spot an opportunity. In 2001, Kulp was hired away from an Applebee's in Grand Junction, Colorado, where he'd worked throughout college, by restaurant franchise veteran Gary Zancanelli and his son, Gary Jr. Both had previously been with Harman Management, a large KFC franchisee. The elder Zancanelli had learned the QSR business from KFC's first franchisee, Pete Harman, the innovative Utah businessman who helped Harland Sanders build his secret recipe for chicken into a brand. The Zancanellis had launched their own venture with a sports bar concept and the purchase of a group of five KFCs in Grand Junction in1999. Kulp would immerse himself in the school of restaurant operations and, at 21, took advantage of his first opportunity to buy into a business. "They had quite a history in both franchising and the QSR industry and were operational experts," says Kulp, who in 2001became Zancanelli Management's COO. "The first restaurants that we worked together were not that dissimilar to the restaurants we look to acquire today," he says. "They were kind of underperformers. We significantly improved them, investing in the assets, and saw both top-line and bottom-line improvement." Over the next decade, Zancanelli Management would expand from those five KFCs to 64 restaurants, when father and son decided to cash out. With some investor support, Kulp purchased the founders' shares and became CEO of the 64-unit venture. In 2011, he renamed the company KBP Foods, embarking on a course of meteoric growth and record-breaking revenue as one of the largest franchisees of Yum Brands. "One of the things we have probably done best is to not change a lot, which is one of the mistakes I feel like I have watched a lot of people make," says Kulp. "We have not changed our approach to the way we have looked at our infrastructure, and have not tried to dramatically leverage our infrastructure as we have grown." While KBP has seriously considered diversification and has operated other brands over the years, the opportunities with Yum have been significant, says Kulp. The company's growth-through-acquisition strategy has come largely through big deals--most recently a 91-unit purchase in 2016, and the 2017 addition of 78 KFC locations in three states. In 2018, KBP took a different tack, adding 125 restaurants through 20 independent deals--averaging five to seven units each--and roughly 20 new restaurants, built from the ground up. Throw out the holidays and traditional business downtime that typically occurs over a year, and Kulp estimates that KBP closed a sale and opened a new store every other week. Kulp, who targets 75 to 125 units of growth each year, has said no to deals far more often than yes. Acquisitions must have scale or geographic contingency to existing markets, where there are three levels of operational infrastructure in place. This approach has allowed KBP to expand at a rapid pace, without leadership feeling "as if they have their hands in seven different places at one time with multiple focuses," says Kulp. Unlike many enterprises of KBP's size, where one VP might oversee 400 restaurants, the company is flat by design. KBP has 22 third-level leaders, eight VPs, two SVPs, and invests "$7 million to $8 million more than you would ever see elsewhere at just that level alone," says Kulp. "What that translates to, is that someone in Chicago has 60 restaurants. They are a third-level leader, an equity holder, and the only thing they oversee is Chicago," says Kulp, explaining his three-level management structure. "So what you have is someone whose family's future is invested in this business overseeing six reports in Chicago, and they are one level away from the restaurant. That is how we are able to really affect the quality of people, the message being delivered, and keep those messages consistent. For these people, those individual restaurants are what they do--all day long, every day." Kulp also takes a thoughtful approach to his investment in people. He calls his decision seven years ago to add equity partners "life-changing" for both the internal managers--now numbering 40--and his own motivation as a leader. He is proud of the broad mix of financial, developmental, and incentive-based strategies and programs KBP has in place as part of his continual focus on building a strong corporate culture. He also believes in giving back. Kulp and his wife Stephanie Kulp formed KBP Cares in 2015 after years of trying to cut through the red tape to help their employees. She serves as president of the nonprofit that provides financial grants to employees in times of critical hardship. KBP also donated almost $2.5 million and 40,000 volunteer hours to local charities over the past year. "What we have worked really hard to try to do as we have grown is to act, behave, and communicate in the same ways as we did when we were a much smaller business--which is much easier said than done," says Kulp. "We have tried not to become the big behemoth and behave differently, whether to franchisees around us or inside our business." Kulp is a strong believer in franchising, but says that with the current labor environment and tax challenges, any blips in the macroeconomic climate could lead to an interesting time for franchising in the coming years. Nevertheless, he remains focused on growth. What that growth will look like--domestic, international, more KFCs and Taco Bells, or the addition of another major brand--depends upon the opportunity. "We will continue to be opportunistic and make sure it fits a model that makes good sense for us," Kulp says. Local hamburger restaurant as a cook at 14. 1) The continued growth of KBP Foods, which has been fueled through the successful integration of more than 30 acquisitions across 24 states, onboarding more than 14,000 employees. 2) The formation of KBP Cares, a 501(c)(3) non-profit organization/employee assistance program affiliated with and supported by KBP Foods and its employees. At KBP, we believe that no employee should have to face a critical hardship on their own. Several years ago, we created KBP Cares as an innovative way to scale the company's ability to provide assistance for employees facing critical hardships. For those who have nowhere else to turn, KBP Cares is a lifeline. With support from employees from across the company, we provide hope, support, and relief for KBP employees and their families during challenging times. KBP Cares is truly a passion project for my wife, Stephanie Kulp, who serves as president and played an instrumental role in getting the program up and running. 3) The opportunity to help nearly 40 key members of management to meaningful equity positions within KBP, allowing them to reap the financial rewards of their hard-earned efforts. As our business has grown larger, it has become easier to be mediocre with every turn. Finding creative and unique ways to think, communicate, and behave with the passion, pace, and intimacy of a smaller organization challenges us every day. Finding new ways to grow and evolve our business, while continuing to provide rewarding career opportunities for our team and deliver value to our equity partners (both internal and external). Partnering with the Zancanelli family, whose generosity and belief in me sparked my passion for this business and my career. Building a capital structure that brought key members of our management team into equity positions. This opportunity helps us to attract and retain the best of the best, and has a significant impact on the way these key leaders behave across our organization. I lost my father when I was quite young. I learned that you should never wait to say the things you want to say, do things you want to do, or prioritize as you see fit. Life is short. To find the smartest, best mentors who you'd never think would take time out of their day to talk with you. They just might. In fact, I've yet to have one tell me no, and I have asked some pretty accomplished leaders for their time. It's a constant balancing act, which I am better at some times than others. I have an amazing wife who takes care of so many things for our family and me, which allows my time to be better spent when away from work. I have gotten better over the years saying, "No," and I don't waste time on meaningless tasks. A mentor once taught me that "Your calendar never lies." A great bourbon and cigar, a terribly overpriced pair of shoes, and, of course, KFC's Original Recipe. About a year ago, our management shareholders gave me a book. Each of them had taken a page and written a note to me. This is my new favorite book. Two things I still want to learn: 1) to speak Spanish fluently, and 2) to play the piano. A lawyer (thank God that didn't work out). Be the best at what you do; do something that you can be the best at. Surround yourself with a team of smart, talented people who you can trust and have fun being with. Don't confuse being soft with seeing others' point of view, and do whatever it takes to help others win! See "Biggest current challenge" above. That I prefer everything in moderation--especially moderation! There is no one thing I am looking to be better at doing. There is nothing that I do that I could not do better. Every day I look to be better, and I have a long way to go. I believe in taking calculated risks. At KBP, we emphasize the importance of using data to guide decisions. If the data supports going in a new direction, I'm on board. Our leaders challenge the status quo regularly and know that we value the courage to do so. We have great operational leadership. I stay very close to their key initiatives and the results achieved through our operations. The team does a great job keeping me in the loop. Additionally, we work to maintain a regular cadence of visits in our restaurants throughout the country. 1) Innovation, running the gamut from product to facilities and technology. Innovation is critical to our success. 2) Product quality and safety standards leadership. True partners who seek to understand our business and deliver products and solutions that exceed our expectations and remove barriers. We view our vendor partners as an extension of our company and hope that they view us the same. Our marketing strategies are ever-evolving. They are often very different by market and even by trade area. We believe this is critical to compete at the highest level. Social media has changed the landscape of our business in many ways. It has allowed us to reach consumers in a variety of new ways, and it has allowed us to engage our employee base more efficiently and more frequently. However, it has also created the need to be much more aware of the ability for any information, irrelevant of its validity, to travel very quickly. We have a very systematic process that we use for hiring and terminating employees--the collective goal of these tools being that we do less of both! A problem on a team can never be underestimated. Fortunately, the strength of our team today has grown to a place where the wrong players often weed themselves out. If not, we have never been hesitant to act on a problem. If someone is focusing on what is best for themselves, before what is best for those they are responsible for. $780 million at 2018 fiscal year-end. The quality of our growth has always been our barometer. We have never set out to achieve a revenue number or a specific unit count. We want to create value for our shareholders, and help our teams to find professional and financial success. I'm hopeful that 5 to 10 years from now we will have invited a significantly higher number of management team members into our equity partnership, created life-changing outcomes for dozens more, and that our continued growth will still be providing professional and financial upside for people at rates they cannot find anywhere else. The current macroeconomic situation has brought with it one of the most challenging hiring environments we have experienced. To continue to lead in this environment, we are having to be sharper with retention tactics, more competitive with pay, and are amending policies and programs we have had in place for a significant time. We have restaurants in nearly 70 DMAs across the country. The threads running through these markets are low unemployment, increasing wages, old restaurants being remodeled, and new restaurants being built. Generally, ticket average has been growing, traffic has been challenging, and we are seeing modest growth. We use a regression-based model with coefficients calculated for multiple variables to forecast sales, project costs as accurately as possible, and project growth to the best of our ability. In a growing business, this is not simple. We have been fortunate over the years to have partnered with great capital partners and lenders. I don't believe there is a one-size-fits-all answer to this question, but rather a very different answer for each franchisee based on the makeup and needs of their business. Our intentional growth is driven by the desire to provide personal, professional, and financial opportunities for employees at all levels throughout the organization. To highlight a few, this includes the ability to apply for college scholarships, participate in six-month professional development programs, an avenue to apply for financial assistance in times of hardship (through KBP Cares), celebrate with your loved ones at a 5-star resort in Mexico, and more. In our industry, it doesn't matter where you've come from--anyone can become very successful if you have a passion for people and work hard. We expect a lot and, in turn, try to do a lot to go above and beyond to celebrate differently, to recognize performance differently. There is a lot of hard work going into pricing and optimization efforts to try to combat raising wages. However, in many instances, we simply are not able to offset all of these increases. We are hopeful that inflation will catch up with these increases in the near term, as the current environment is a very challenging one. We have built a culture of recognition. Our "Shout Out" program is designed to celebrate excellence in our restaurants every day through posts on social media. We also have an annual contest that recognizes managing partners and area coaches from across our business. They are measured on key performance metrics throughout the year and the winners enjoy a trip, with their spouse, to an exotic resort destination for four days of food, fun, exclusive experiences, and an awards banquet recognizing them. We also have Circle of Excellence (COE), which is our president's award. COE recognizes individuals who perform at a consistently high level, both inside the company, as well as out. Recipients have demonstrated an incredible level of integrity in their work and personal lives. Each COE name is etched on the Wall of Excellence at the Corporate Support Center, signifying the place that person holds in the history of the company, and distinguishing their mark on KBP Foods. We also have numerous professional development programs for high-potential employees and unique, competitive compensation programs for top performers. What would I do all day long?